The Morgan Street Food Hall is now open! There are plenty of dining options for lunch and dinner throughout with a little retail on the side as well. Make sure to check out the vendors on their website ahead of time to avoid getting stuck in the crowds when it’s busy. Lunch and dinner have been packed from what I hear and with the cool weather about to show up, the food hall is sure to be pretty lively. The place looks great and is a far cry from the club/bars that used to pack this warehouse years ago. Kudos to the team behind it and I look forward to many visits! We’re chatting about Morgan Street Food Hall on the DTRaleigh Community. Join us. For this restaurant update, the energy seems to be building in and around Moore Square. There are a few delicious places to try now as well as ones to look forward to this year. We’ll first start out in Glenwood South as LM Restaurants has delivered a very unique experience in Vidrio. Located at the corner of Tucker and Glenwood, Vidrio is one of LM’s platinum restaurants and a truly Mediterranean experience. The place impresses for sure. The Cardinal, a house turned bar on West Street north of Peace Street, is now open. In addition to drinks, they serve cheap hot dogs, which are pretty good actually especially with a great view of downtown Raleigh. Cafe Helios has closed and in its place, the folks behind Jose and Sons, a Mexican restaurant in the warehouse district, are creating a new concept called The Cortez Restaurant. A craft beer bar, with the sign suggesting it will be called, “Craft Beer Bar”, is going into the former Eden Lounge and convenience store near Glenwood and Hillsborough Street. Work continues on a new bar called 616 Glenwood in the former Harry’s Guitar Shop. Tobacco Road Sports Cafe has now reopened on Jones Street, where Natty Greene’s used to be in the Raleigh Electric Company Power House. In their former location in the 222 Glenwood building, La Santa Modern Mexican is planned. You can follow their progress on their Facebook page. 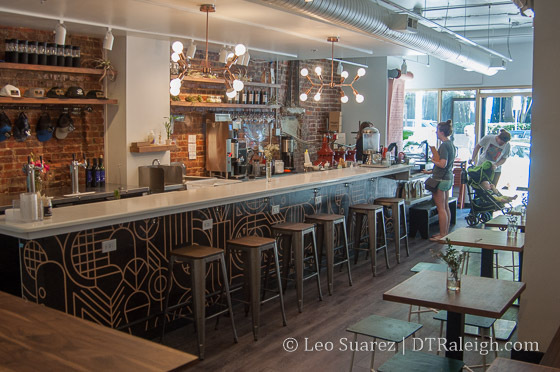 On Hillsborough Street, The District is now open in The Dawson. Hopping over to Fayetteville Street, the quick turnover of Bolt Bistro into Pizza La Stella is finished and the new restaurant is now open. Tir Na Nog is back! After closing from their long-time home on Blount Street, the bar is back open on Hargett Street next to The London Bridge Pub. Last I was there, it was a bar only with plans for additions and a small food menu in the near future. The Busy Bee has closed but quickly changed concepts to Trophy Tap and Table, which is now open. Another change on Wilmington Street, Joule has closed and a new concept is in the works. St. Roch Oyster + Bar is being worked on and you can follow them on their Facebook page. Cursed location? The restaurant space in the bottom of the Progress Energy building is turning over again and Tulum Restaurant and Bar, a Mayan-themed restaurant, is close to opening. You can check them out on their Facebook page. Scott Crawford’s new place, Crawford and Son, is now open on Person Street. Ending the tour at Moore Square, Royale, an American bistro, is now open at the corner of Blount and Martin Streets. Check out the Royale burger below. You can now get gelato, and crepes and waffles all at the same time by the way, in downtown at Amorino, which is now open along Davie Street in The Edison. City Market Sushi has opened on Blake Street in City Market. The Outpost, a tiki-themed bar at the corner of Hargett and Person, is now open. The segway shop Triangle Glides moved out of their large space along Blount Street. A new restaurant is coming there from those behind the Pho Nomenal Dumpling food truck called Mofu Shoppe. Follow them on Facebook. Sitting empty for years, the retail shop in The Edison parking deck facing Blount will now have a tenant. Growler USA is craft beer pub chain that is rapidly expanding and will open their first Raleigh location here. Brewery Bhavana, the brewery and dim sum restaurant, continues to come along. So proud of this project! A true collaboration with friends. Can't wait to see @brewerybhavana come to life!!!! Raleighwood Provisions, a local foods store located in The Edison, continues coming together. You can follow them on Instagram and if you haven’t, read about them in this N&O article. A new coffee shop called Sir Walter Coffee is planned for, you guessed it, The Edison building. They claim to be a coffee, tea, and bottle shop. Downtown’s Taz is getting close on Oak City Market House of Fresh in the Skyhouse Tower. The place will be a small market and deli. They are now hiring. Take a look here. Email readers: This blog post has a virtual reality image in it. I recommend you click through to the site to see it. 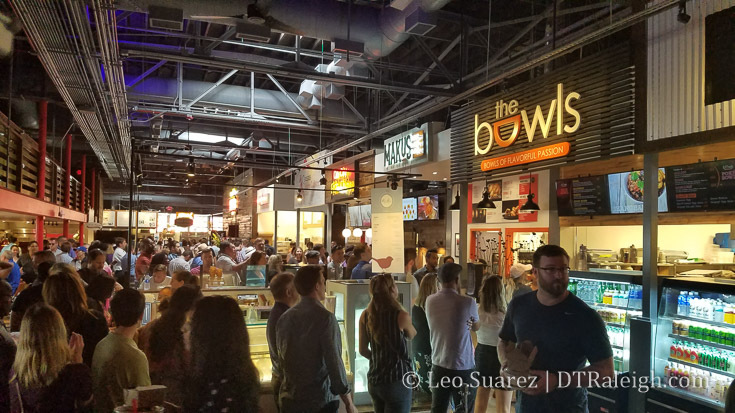 New eats are tasty but what can also be exciting, to me anyway, are reasons to revisit some places as they are doing new things or new folks are bringing a new twist on it. This season’s update shows a lot of new concepts in old places, hopefully bringing you back in for a fresh take. Kicking things off are new brews from Oak and Dagger. The pub is now opened, shown at the top of this post, in the former Tyler’s space in Seaboard Station. In addition to their already running bottle shop, the brewery has a small menu of eats and lots of space for large parties. Sort of near the Person Street area, Brewerks, a cafe and bakery in the former Quality Grocery space, is now open. Scott Crawford’s new restaurant, Crawford and Son, in the former Piebird space was on schedule to be completed by the end of October. The place seems to be close to opening and you can subscribe to updates on their website. In the Warehouse District, Parkside is now open on the corner of Martin and Dawson. They are open for lunch and dinner every day. The Morgan Street Food Hall has a running website and is taking applications for those interested in setting up inside. It was reported that Ed Mitchell is bringing Que to the location as one of the first ones to sign up. In Moore Square, Empire Eats was chosen to run the food kiosk in the upcoming Moore Square redesign. Called Square Burger, they will be serving burgers with (wait for it) square patties on potato buns. City Market Sushi is planning to open in November. Located in the former Troy Mezze space, the folks behind the new restaurant want to offer a more casual, and less expensive, approach to sushi. Amorino, the gelato shop coming to The Edison Lofts, is still being worked on. Last I saw, it looked like there is a lot of work to be done. The Outpost will be a tiki-themed bar located in the house at the corner of Hargett and Person. In addition to their casual atmosphere, the space will reach out to non-profits looking for space for events. They should open very soon. Even though Niall Hanley is busy with the Morgan Street Food Hall, he’s working on a new concept for the basement under Caffé Luna. Named Watts & Ward, you’ll enter the 6,000 square foot bar from the steps facing Blount Street under the Montague Building. Raleighwood Provisions is a new project from those behind Bittersweet. Located in The Edison Lofts, the shop will sell a wide variety of high-quality, local foods. The plan is to open before the end-of-year and you can follow them on Instagram. The new restaurant in the former Battistella’s space will be called Royale and hopes to open by the end-of-year. On Hillsborough Street, Dram and Draught is now open, serving beers and whiskey out of the old Esso gas station. The District, going in the former Hadley’s space in The Dawson, is now hiring. They will serve “asian-inspired cuisine with a southern influence” and hope to be open mid-November. In Glenwood South, Vidrio, the Mediterranean restaurant for the corner of Tucker and Glenwood Avenue, is now hiring. In the West at North building, Little City Brewery is now open. Remember the Tobacco Road Sports Cafe? Well, they were supposed to be open sometime soon but still no update on their new location in Powerhouse Plaza where Natty Greene’s used to be. They were doing some hiring about a month ago so hopefully it’s any day now. On Fayetteville Street, Bare Bones is now open and serving up beer, burgers, and ribs. The new restaurant from Eschelon Experiences is located in the PNC Tower where Zinda was formerly located. Nearby, Carroll’s Kitchen, the non-profit restaurant with a mission to help homeless women, is now open at the corner of Martin and Wilmington Streets. Living Kitchen, the raw and organic restaurant, has now opened in Charter Square. Wahlburgers, a burger chain started by actors Mark and Donnie Wahlberg, is coming to The Hudson where The Oxford was formerly located. It’ll be the first in North Carolina. Bolt Bistro is changing concepts. In a month or so, the place should reopen as Pizza La Stella, serving pizza to Fayetteville Street patrons. The London Bridge Pub is adding a kitchen. With their expansion into the next door space, they have plans to add a small menu and build from there. The food should start cooking in mid-November. To quote the great philosopher Lauryn Hill: "Ready or Not, Here I Come, You Can't Hide Gonna Find You and Make You Want Me" We are officially OPEN. Stop by and see us tonight! Starting on Fayetteville Street, Eschelon Experiences has opened The Haymaker, pictured above, in Charter Square. The menu has fancy cockatails, wine, beer, and even champagne on draft. Again from Eschelon, Bare Bones, a ribs and burger restaurant in the PNC Tower, is close to opening. Follow them on their Facebook page. Carroll’s Kitchen plans to be open in August. The non-profit restaurant that aims to provide job training to women facing homelessness will be located in the former Square Rabbit space on East Martin Street. Living Kitchen, the raw and organic restaurant opening in Charter Square, looks very close. Check out a preview from a few weeks ago on Raleigh Agenda. In Glenwood South, the Gramercy Pharmacy and Market is set to have their grand opening on August 2. The market will include “full service pharmacy, groceries and produce, freshly made sandwiches, household staples and beauty items, as well as a range of beer and wine.” Read more about it on this blog post from the Raleigh Downtown Living Advocates. It looks like Little City Brewing is already making beer. The brewery and market is located in the West at North building, facing Harrington Street, and keeps saying it will open this Summer. Vidrio, the Mediterranean restaurant planned for the corner of Tucker and Glenwood, plans to open soon. With no activity for awhile, the former Benelux Cafe location in City Market has a new restaurant. Cafe Lucarne, with the backing of those behind The Stanbury restaurant, is now open. The same folks want to open something else nearby, in the former Battistella’s space at the corner of Blount and Martin Streets so look out for that later. A gelato shop is opening in the Edison Lofts building, facing Davie Street. Amorino is an international cafe with US locations in Chicago, New York, Vegas, Beverly Hills, San Francisco and soon, Raleigh! James over at the Raleigh Public Record noticed a permit for a new bar on Hargett Street called The Volstead Bar. There’s nothing much outside of that so we’ll keep an eye out for it. The paper is down and 42 and Lawrence is now open in the Skyhouse Apartment tower. The organic coffee bar and juice rail is quite a unique experience. On Hillsborough Street, the whiskey bar Dram and Draught might be open as soon as you are reading this as they are very close. The space looks well done and it’s good to see some activity on the old gas station that was empty for many years. The Person Street area got some big news recently as chef Scott Crawford announced a new restaurant for the former Piebird space on Person Street. Crawford and Son will be a 60-seat restaurant serving modern southern food. Nearby, a new speakeasy is planned by Jason Howard, formerly of The Rockford in Glenwood South. Over near Nash Square, Parkside is now hiring. 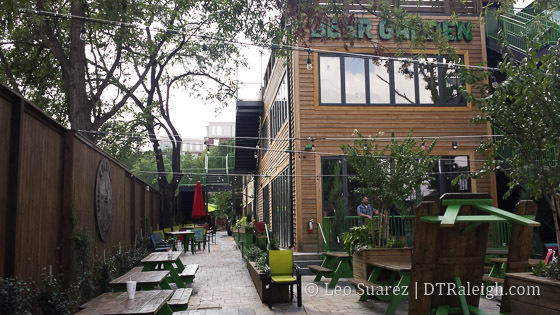 There have been lots of photos of Whiskey Kitchen‘s new outdoor seating. (see below) They plan to open very soon. I’m excited to share a new addition to my seasonal updates. Leading up to each restaurant roundup, there is extensive note taking going on behind the scenes. Now, my notes are yours! You should already be familiar with the DT Eats page but now I have DT Tips. The page tries to consolidate every upcoming, talked about, and gossiped item out there when it comes to eating and drinking in downtown Raleigh. You can dive into the Tips list here. A few more tweaks are in the works but it’s basically ready to share at this point. Now that that is out of the way, let’s dive into our latest updates. Starting in the Warehouse District, the former Brewmaster’s space at the corner of Martin and Dawson Street will become Parkside, a southern farm-to-fork restaurant. There’s progress being made at Whiskey Kitchen. The upcoming brewpub Oak and Dagger, located in the former Tyler’s space at Seaboard Station, has opened their bottle shop. The pub is still being worked on but they are brewing their own beer now. You can follow their progress on their Facebook page. Brewerks Cafe and Bakery is coming to the former home of Quality Grocery in the Oakwood neighborhood. Pelagic Beer and Wine is planning to move a few doors down to the corner of Pace and Person Street. Provenance is now open in the Skyhouse Raleigh tower. According to eatRaleigh, the house at the corner of Person and Hargett will become The House, a bar and bottle shop with some bar food. Progress continues on Dram and Draught, the pub in the former gas station at Hillsborough and Boylan. You can follow the progress on their Facebook page. Hadley’s is now open in the former home of The Borough in the Dawson building. In Glenwood South, Harry’s Guitar Shop will become 616 Glenwood, a night club owned by Dan Lovenheim who also owns a few other bars on the street. Along Peace Street, the former Mr. Pizza and Salad is now TLC Wings and Grill. This is the second location after first opening in Pineville, NC. Mentioned in a post about West Street, The Cardinal will be a bar and lounge on North West Street. The former home of Duel Lounge in the Creamery Building is now The Milkbar. Blue Mango has changed their name to Indio. Raleigh Roadhouse, a live music and barbecue restaurant, has opened in the 510 Glenwood building. Since our last restaurant roundup, the 222 Glenwood building has seen a lot of action. The space where Bruegger’s Bagels used to be was turned into International Breakfast and Burger by the owner of next-door Sushi O. That only lasted a few weeks. In what seemed like no time at all, the place reopened into China O, an authentic Szechuan and Chinese restaurant. Tobacco Road Sports Cafe is relocating to the Raleigh Electric Powerhouse, where Natty Greene’s used to be, on Jones Street. On Fayetteville Street, the former home of Zinda in the PNC Plaza is going to be a new concept from Eschelon Experiences. Bare Bones will have a menu of comfort foods like house-ground burgers and ribs. They will also throw in some beer, pool tables, and shuffleboard. The TBJ has a first look into Living Kitchen, the raw and organic restaurant being worked on in Charter Square. Also in Charter Square, the b.good is now open. Carroll’s Kitchen will be opening in the former Square Rabbit space at the corner of Martin and Wilmington Streets. The non-profit restaurant has a mission to help homeless women, “empowering them with job training, life skills, and even housing,” their website says. It’s a great cause and they are always looking for volunteers. Isaac Hunter’s Tavern is back on Fayetteville Street, this time at 414 Fayetteville where Common 414 used to be. 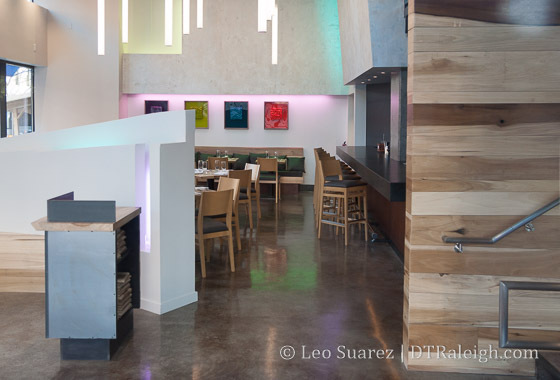 The Twisted Mango in the Progress Energy building has closed and changed over to San Lorenzo Bistro and Bar. Raleigh Raw (pictured above) has opened their juice bar and cafe on Hargett Street. Local Icon Hospitality has opened their latest spot, Virgil’s Original Taqueria, on Salisbury Street. Future home of Dram and Draught. 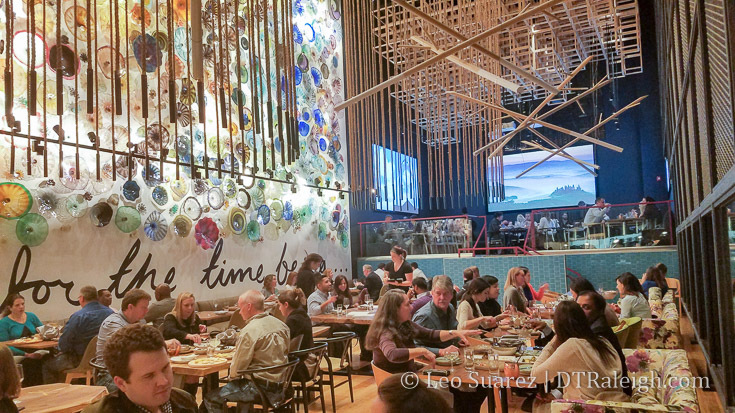 Before we dive into this season’s restaurant roundup, I just want to point out that this is my 1,000th blog post here on The Raleigh Connoisseur! I want to thank everyone who has participated in some way with the blog. Those who’ve read, commented, those I’ve met, and emailed with have all kept the conversations going about downtown Raleigh and fueled the energy to keep this thing chugging. This Fall hasn’t seen as many openings but plans are in place for a big wave of new eats and drinks hopefully in the Spring. Lots of spaces in downtown are still in the early phases of renovation. The much-hyped restaurant Standard Foods, with chef Scott Crawford, is finally open in Person Street Plaza. The restaurant serves dinner with lunch hours coming soon. A grocery concept will also be included in the space but that is also still being worked. Nearby, a beer and wine shop with tasting bar is opening on Pace Street. You can follow their progress on their Instagram. Over near the warehouse district, Whiskey Kitchen looks just about the same as it did since the last update. Ashley Christensen’s pizza place, next door to Poole’s Diner, hasn’t seen much movement as the place on McDowell is still pretty bare. Heavy renovation is happening at 313 West Hargett Street for a new wine bar. Bouncing over to City Market, eatRaleigh pretty much updates us on the status, or lack of, of City Market Cafe. I can’t imagine it being to hard to take a space that once was a coffee shop and turning it into a coffee shop so things don’t look good here. Sometimes you can get a sense of a project just by peaking through the windows. The retail spaces at Skyhouse are paper-sealed tight. No big updates about Provenance, the Oak City Market, or the Larry’s Beans Shop. Holly’s on Hargett was bought out and has now been changed to Notte | Urbana. If you haven’t been following, this is the former Mo’s Diner spot. In Glenwood South, the Mediterranean restaurant planned for the ground floor of the Carolina Ale House building is called Vidrio. A few months ago, they said it would open in the Fall so perhaps it’s almost done or coming very soon. Jon Seelbinder, owner of Level Up Restaurant and Barcadium, was planning a boutique market and brewery in the West at North tower. The space on the corner of North and Harrington is being renovated for this and there’s still lots of work to be done here. The website for more., a restaurant from JMR Kitchens, says it plans to open late October. That could mean they are close to opening their doors on West Street. Ciago’s, located on St. Mary’s Street has closed. It will now be the second location for My Way Tavern. Zaky and Tutti Frutti have closed in the 222 Building. Renovations are underway though for a Crisp Salads franchise. I believe this is the same thing as the one at the Crabtree Mall food court. 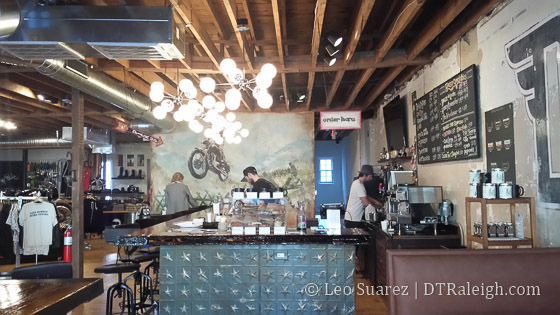 The “adventure lifestyle” shop Devolve Moto is now open and they have a coffee and beer bar. 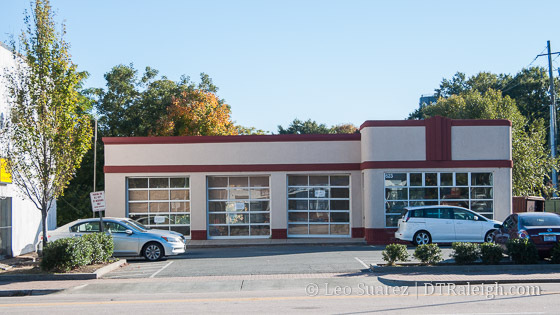 After being empty for quite a few years, the renovated gas station on the 600 block of Hillsborough Street, across the street from Char-Grill, will be a new tavern called Dram and Draught. The Bruegger’s Bagels in the 222 Glenwood building has closed but the owner of next door Sushi O is now working on the space for a new restaurant. Along Fayetteville Street, there hasn’t been much movement on the Eschelon Experiences restaurant planned for Charter Square. Within the same building, a B.good franchise is also planned. This would be the second Raleigh location after North Hills. What started as a pop-up shop, Linus and Pepper’s is now staying on Salisbury Street. Same block, a “trendy taco shop” is also being planned by the same owners. The people behind the dive bar Slim’s have opened another bar called Ruby Deluxe on the 400 block of Fayetteville Street. The lease has been pulled on The Square Rabbit on East Martin Street. Lou Moshakos, owner behind Carolina Ale House, is now working on bakery-concept for the space and something else for the space next door. This summer, there have been some big time openings in the downtown Raleigh Eats scene. One of them even puts us in the Guinness Book of World Records. First, here’s a flier for a new pop up sandwich shop, Linus and Pepper’s, that will be open for three weeks on Salisbury Street starting today. It’ll be student run and is backed by Jon Seelbinder (Level Up Kitchen and Barcadium, The Architect) who also is working on other projects in downtown. Read more about it in the N&O. Pictured above is the rooftop seating at the new location for Taverna Agora. 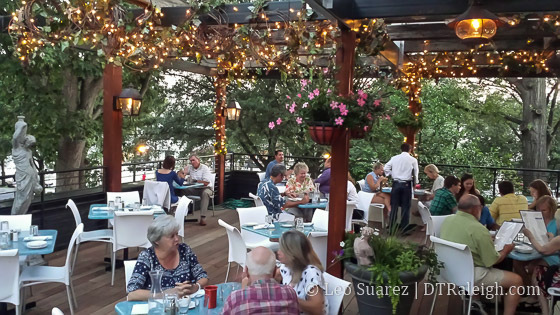 The restaurant moved from North Raleigh to 326 Hillsborough Street and that empty, shell of a building is now more lively than ever. Ashley Christensen’s Death and Taxes has finally opened at the corner of Salisbury and Hargett Streets. Christensen has also announced that she is working on a pizza restaurant that will be located next door to Poole’s Diner. Now that the Charter Square south tower is complete, we’re waiting to see what Eschelon Experiences brings to one of the ground-floor spaces in the building. Construction fencing is up where Whiskey Kitchen will go at the corner of McDowell and Martin Streets. Near Person Street, Standard Foods may actually open. At least that’s what they say as they are now hiring. Person Street Pharmacy has finished their makeover with a new cafe. Photo of the back patio at the Raleigh Beer Garden a few days before opening. In Glenwood South, Niall Hanley and Cliff Bleszinski have set a Guinness World Record for most beer taps. The Raleigh Beer Garden is now open and has 366 beer taps spread across two floors. The place is huge and should be quite a draw within and outside the city. In 510 Glenwood, Big Boom is now open. The new restaurant is from Vincent Barresi, of Vincent’s Italian Cuisine fame in North Raleigh. Near Moore Square, Treat is now open and serves Maple View Farm ice cream. I’m still keeping track of Provenance, planned to open in the Skyhouse Apartments building. The N&O reported that Larry’s Beans is opening up a retail shop in the same building. Still in Skyhouse, Taz is opening up a convenience store (as he does) called Oak City Market. A dive bar called Ruby Deluxe is opening on the 400 block of Fayetteville Street. Renovation work is taking place at 313 West Hargett Street. Twitter chatter says a wine bar is in the works. Zinda has dropped their restaurant concept and is focusing on being an event space and club.